21, which won him promotion to the highest rank of general. But, haughty and proud, he clashed with President Davis, was reassigned from the Virginia theater and became Albert Sidney Johnston's second in command in the campaign leading to the Battle of Shiloh, April 6-7, 1862. Johnston was killed on the first day, and Beauregard assumed command, but failed to follow up his initial advantage, and retreated. Success in 1863 and 1864, when he probably saved Petersburg and Richmond from capture by Grant, did not diminish the fued with —mm—* Davis, who ensured that he never held a major field command again. Beauregard's uniform blou-se perfectly shows the fastidiousness of the man himself, and also like him it* is just a little bit ostentatious. According to Confederate regulations the buttons should have been evenly spaced, but Beauregard had them in groups of three, which was the Federal rule for general officers. 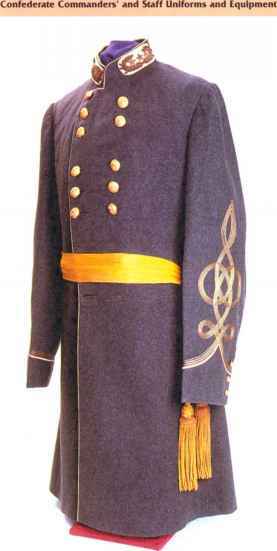 Even more glaring is that the gold braid epaulettes were non-regulation, and worn by very few other general officers during the Civil War, whether North or the South. The belt plaque is unlike any other and seems to have been designed by Beauregard himself. 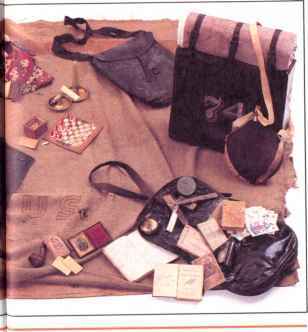 It is a sad reflection on a few Confederate officers that they worried so much about their own clothing and accout-erments at a time when their soldiers had barely enough clothing to cover themselves with, nor shoes to walk in. Below: Pierre Gustave Toutant Beauregard in the uniform of a Confederate general. 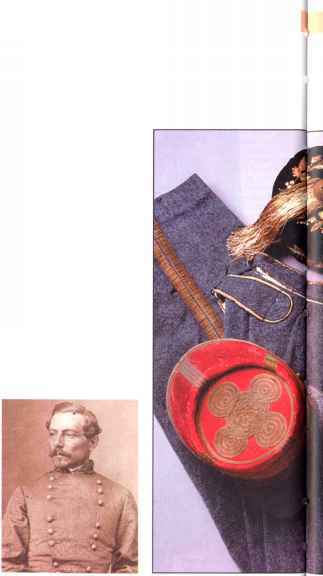 Trousers and Uniform Accessories of Maj. Gen. P. G. T. Beauregard, C.S.A. 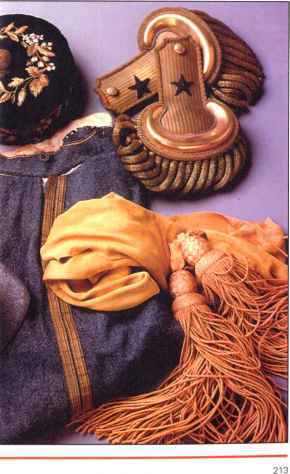 Beauregard's trousers were a regulation gray with the correct general's twin gold stripes while his sash was an equally correct canary yellow. His tasseled beret was no doubt intended for off-duty relaxation and was almost certainly embroidered by a lady, possibly his wife. The epaulettes, however, were intended to be worn with uniform and must have been made specially for Beauregard somewhere in the Confederacy or imported from Europe. The kepi, too, is very ornate, with its crimson color and brown leather peak offset by the gold braid. 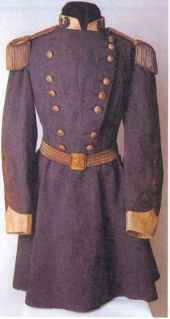 What did confederate generals wear? What wear the uniforms in the battle of shiloh? What were respective strengths of p.g.t beauregard?